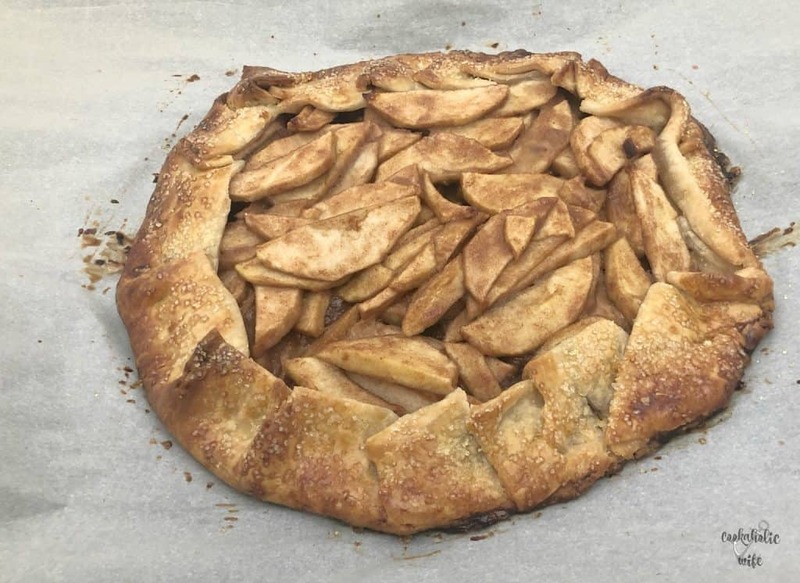 If making an apple pie from scratch is something that’s intimidating to you, you should definitely try making an apple galette instead. 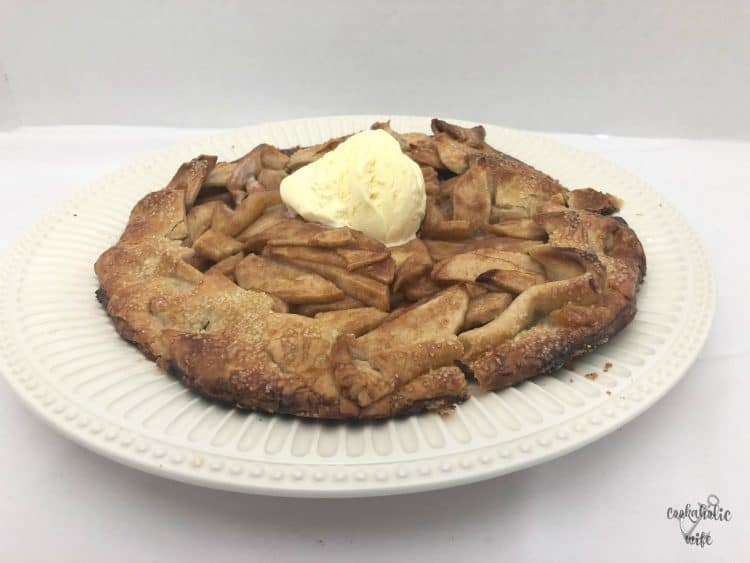 It’s very similar to an apple pie, but rustic, so you don’t need to worry about it getting the dough to crimp just right in the pie pan or perfectly arranging the apples. An apple galette is made directly on a baking sheet where you simply add the apples to the pie dough and then partially close it up around the apples and bake it from there. How easy is that? Just like with an apple pie, you can use any type of apple that’s good for baking. I prefer to use honeycrisp because of their flavor and how well they hold up in the baking process. An apple galette is the rustic version of an apple pie, filled with fresh apples, cinnamon and sugar and baked in pie dough. Preheat the oven to 450 degrees. Line a large baking sheet with parchment paper. Roll out the pie crust on the parchment paper. In a medium bowl, toss the apples, sugar, cinnamon and cornstarch together until well coated. Arrange the apples in a layer in the center of the pie dough, leaving about 2 inches around to fold in. Fold in the pie dough to partially cover the apples, crimping it if you like. Brush the beaten egg over the dough and sprinkle with sanding sugar. Bake for 30-35 minutes or until golden brown and the apples are soft. Remove from the oven and let cool. Slice in the wedges and serve with scoops of vanilla ice cream, if desired. So much easier and much less prep work than an apple pie! 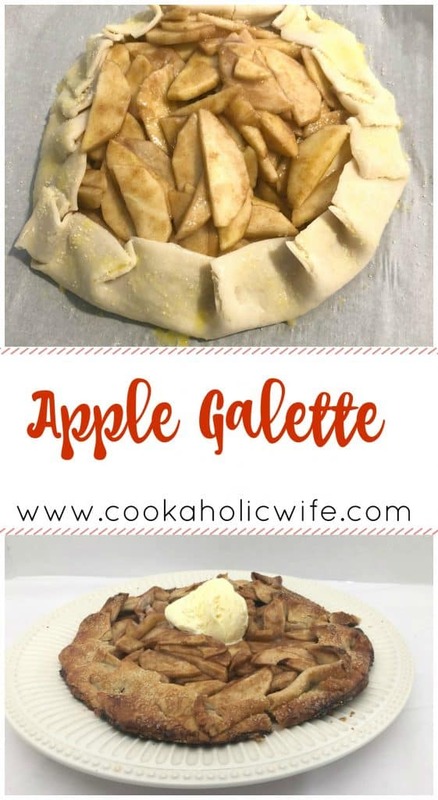 I hope you’ll try out making an apple galette.